Describing Fibre to the Cabinet (FTTC) as Fibre Broadband (more truthfully ‘phoneline broadband’ on shorter lines) has led to (a) great confusion for consumers and businesses and (b) huge dissatisfaction when advertised speeds cannot be delivered on account of the variable constraints of the remaining copper in the final link. Thankfully that dilution of truth by Fixed Operators has not yet been mimicked by Mobile Operators. If they did so, any cellular mobile service delivered from a Base-Station linked to the wider world by fibre optics could be marketed as ‘Fibre Mobile’ – a tag that would seem nonsensical as many folk imagine that Fixed and Mobile broadband are direct competitors. Not all cellular Base Stations are currently fed by fibre ‘backhaul’. Many of the consumer complaints of poor mobile service are rooted in coverage and capacity limitations (congestion) further back in the network and in an environment where highly variable demands on the service make tailored design difficult. Design complications arise not only from the siting of Base Stations and their ‘backhaul’ capacity. There are technical limitations with wireless propagation – radio signals behave differently in different parts of the spectrum. Designers must contend with a wide range of physical environments – the thickness of walls, foliage on trees and user devices moving at speed across Base Station areas – and they are also constrained by the licensed spectrum available, typically with separate upload and download frequencies. The point of these observations is that these constraints and performance limitations will be cruelly exposed in the coming era of 5G Mobile. That exposure stems from (1) raised expectations of vast capacity to deliver video and other interactive ‘cloud’ applications and (2) the intended use of much higher radio frequencies. System designers will gain some relief from those challenges by advanced antenna design and complete digitalization – nearly all traffic is now in data form, including voice calls that in earlier mobile generations (and fixed line telephony) were ‘analogue’. The dominant service design factor is the frequency. Ofcom is already planning to licence frequencies above 26GHz – vastly higher than currently used spectrum typically around 1.8 GHz to 2.6GHz. Lower frequencies (or in old terminology ‘Long Waves’) can travel further – hence the use of 0.7GHz for TV and radio broadcasting. Some of that legacy TV spectrum usage has been cleared away to make room for wide area coverage of low data-rate services – typically sensors linked with ‘Internet of Things’ applications that often operate only in one direction. Higher frequencies are best used for higher-intensity and interactive applications – and readers will be familiar with the large dishes that beam signals ‘line of sight’ across the country. 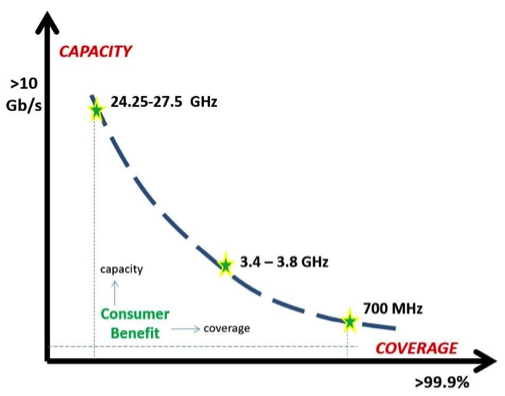 At the frequencies now being considered for use in 5G mobile devices, typical coverage areas are reduced to around 200-metre radius and indoor penetration through walls becomes an issue – but throughput capacity is not so much of a problem. 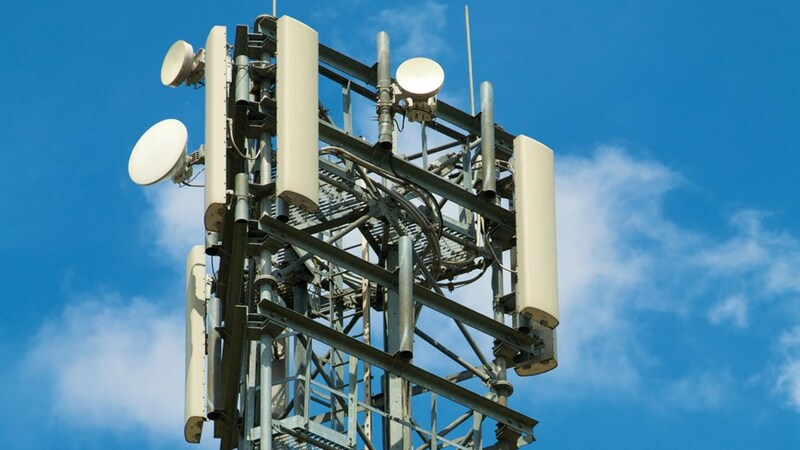 The bottom line on 5G design development is that a vast number of very small lower-power base stations will be needed. These may be more like today’s WiFi routers, or in the style of pizza boxes, with external antenna that are almost invisible compared to today’s mighty masts. And almost all will need a high capacity link back to the Internet and other networks in both directions. Estimates vary but complete coverage of the UK’s 24million hectares and property (outside and indoors) could, in theory, need between 5 to 7 million small base stations requiring high capacity fibre optic connections. The current operating model, with few sites earning high revenues for property owners, will need to change to many sites (including street furniture such as lampposts) with low (or even zero) wayleave fees. It does not take a genius to understand that the future of Mobile communications is inextricably linked to the local availability of fibre connectivity that is (a) future-proofed (unlimited capacity) and (b) symmetric i.e. having an equally high speed in both directions. Short-term improvements for current systems such as ‘national roaming’ and ‘mast sharing’ do not address the longer-term challenges – although they may provide some clues for future technical design and the shape of future regulatory and competitive (but more collaborative) market forces. What is urgently needed is a reimagining of how we transition from the established notions of infrastructure competition to a more advanced appreciation of consumer and business needs and encourage the willing cooperation of users in shared infrastructure development. At the same time, the UK’s ability to implement 5G Mobile requires a complete rethink of fixed line environments. The passive infrastructure (i.e. holes and poles) needs to be liberated and, like other utilities, managed in partnership with public agencies. Renewed investment in this arena is challenging and less than glamorous but urgently needed in this era of full-throttle fibre transformation. Surely with that imaginative but radical ‘separation’ we could envisage a massive shift away from legacy copper networks to energy-efficient pure fibre optics. Sadly most of the public investment in the asymmetric ‘Superfast Fibre’ broadband (FTTC) ‘cul-de-sac’ has been a colossal diversion from the long-term ‘future-proofed’ requirements. Our economy’s future now depends on policy developers, regulators, local governments and industry setting aside previous tech-ideologies and reaching an understanding of future interdependencies. Only then can the work of educating consumers and enterprise begin – an essential first step towards a more collaborative future that can enable the transition to 5G. spot on. Many to many, and a fibre link to feed. We have just wasted a decade on whipping the copper donkey to go a bit faster. We need fibre in this country. Both moral and optic. Might I suggest we are STILL WASTING a vital opportunity. Whoever thought that G-Fast and Fibre-to-a-remote-node could possibly rectify the dire need for a minimum of 1 Gbps symmetric broadband ? “Dire need” takes into account the likely deployment times for a completely new future-proofed Fibre to the Premises solution. As just one example the incumbent is NOT deploying any Point-To-Point (P2P) domestic fibre as it sees the symmetric distinction of being able to charge wholly unjustified eye-watering figures for that “extra” facility. Yet the deployment costs are very similar and P2P is far easier to maintain without disturbance of up to 31 other sharing services.